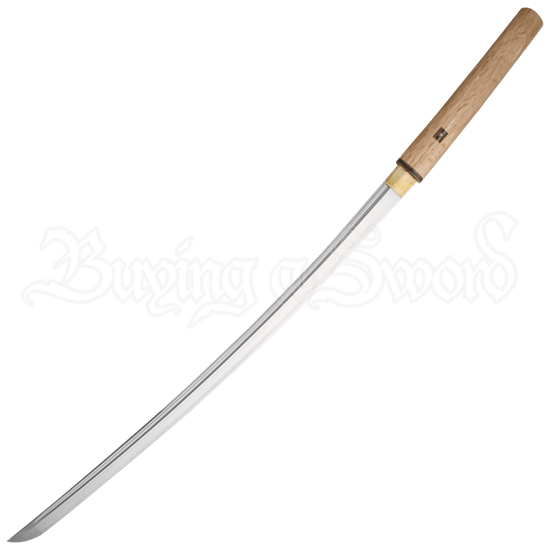 This gorgeous oriental sword makes a fantastic addition to the collection of anyone who loves traditional Japanese blade designs. The Natural Wood Shirasaya shows off a lovely pale wood handle with real buffalo horn koiguchi. The matching scabbard has been lacquered to a high gloss to finish the look. The functional shirasaya sword is crafted with a high carbon steel blade with a fuller. The samurai sword comes with a certificate, sword bag, and cleaning kit that collectors are sure to appreciate. Whether you are looking for a practice weapon or display sword, this hand-forged shirasaya makes a great choice.